ElasticHQ enables developers and devOps users to quickly manage and monitor all aspects of their Elasticsearch clusters. From monitoring individual node and index metrics to live-streaming of health information during heavy tasks, HQ provides a one-stop solution for all things Elasticsearch. Status information is presented as-it-happens, across any of your clusters. Drill down to any specific Index or Nodes for an in-depth view of all pertinent metrics. 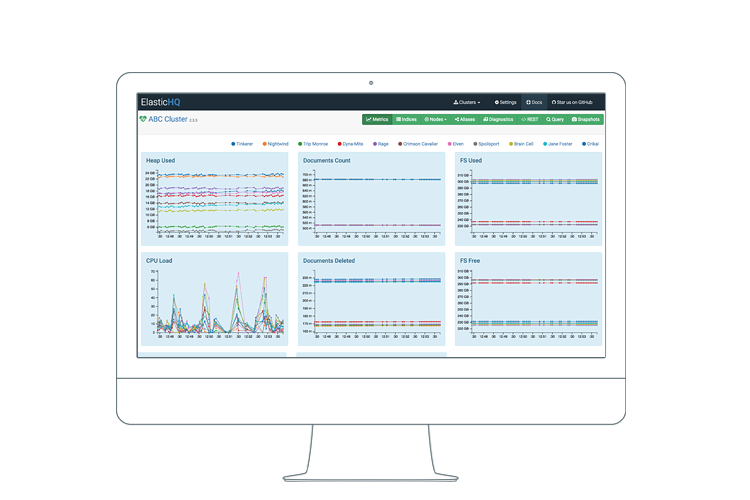 Stay on top of your cluster health in real-time with top-level overview data and drill-down fine-grained stats. ElasticHQ connects to all of your clusters, regardless of Elasticsearch version, and allows you to monitor and manage them all from one interface. Refresh, Optimize, Create, and View Indices and their Metrics with a simple click of a button... Shard and Alias information included. Stop fighting cURL, REST APIs, and JSON formats. The powerful REST UI does it all for you, with single-click actions. Supports Elasticsearch versions 2.x, 5.x, 6.x, and whatever the latest branch may be in the works. ElasticHQ analyzes key metrics across all of your nodes, and actively provides helpful hints and solutions. Easy-to-use JSON editor allows for querying indices or aliases. Even if some of your clusters go down, ElasticHQ keeps on ticking. It is designed to run 24/7 standalone and not dependent on the health of the clusters it monitors. View the structure of your documents in one easy-to-read user interface. Easily copy entire indices or just the mappings with just a few clicks. ElasticHQ removes the guesswork in working with and maintaining Elasticsearch clusters, by actively monitoring health, providing rules-based diagnostics, and making index management one-click away.